A figure inexpressibly thin and pathetic, of a dusty leaden colour, enveloped in a shroud-like garment, the thin lips crooked into a faint and dreadful smile, the hands pressed tightly over the region of the heart. “Buried in woolen” refers to the Burial in Woollen Acts of 1666-1680, requiring burial in a shroud of pure English wool. The acts were resented and were largely ignored after the late 18th century. They were repealed in 1863. Obviously the walking dreadful woman was one of the unhappy woolen-shroud wearers. 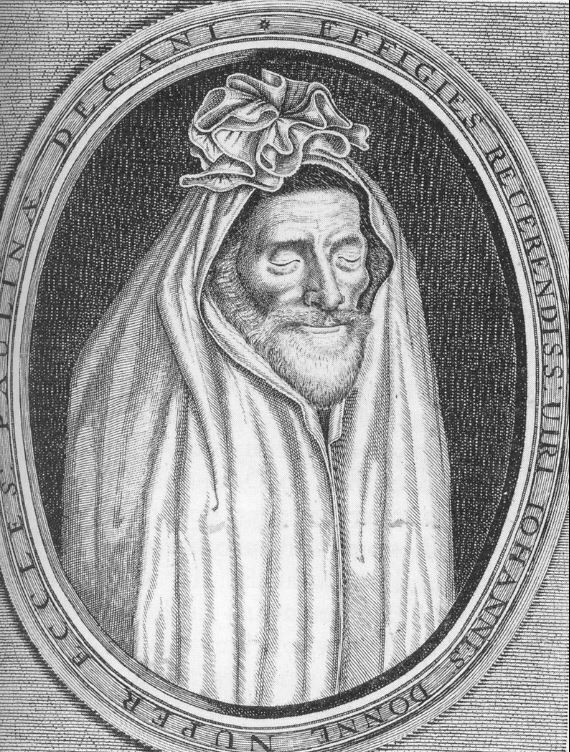 Some of you may be familiar with the statue of John Donne depicted in his shroud, which is knotted on top of his head, as pictured in the engraving above. This ghost, seen in a church chancel, presented a virtually identical appearance, as well as making a curiously incongruous rustling noise. Sometimes even the minutest details of the shroud were noted by a witness. About a month after this occurrence, [the appearance of her husband’s doppelganger] Mrs. A., who had taken a somewhat fatiguing drive during the day, was preparing to go to bed, about eleven o’clock at night, and, sitting before the dressing-glass, was occupied in arranging her hair. She was in a listless and drowsy state of mind, but fully awake. When her fingers were in active motion among the papillotes,[papers for making butterfly curls] she was suddenly startled by seeing in the mirror, the figure of a near relation, who was then in Scotland, and in perfect health. The apparition appeared over her left shoulder, and its eyes met hers in the glass. It was enveloped in grave-clothes, closely pinned, as is usual with corpses, round the head, and under the chin, and though the eyes were open, the features were solemn and rigid. The dress was evidently a shroud, as Mrs. A. remarked even the punctured pattern usually worked in a peculiar manner round the edges of that garment. Mrs. A. described herself as at the time sensible of a feeling like what we conceive of fascination, compelling her for a time to gaze on this melancholy apparition, which was as distinct and vivid as any reflected reality could be, the light of the candles upon the dressing-table appearing to shine full upon its face. After a few minutes, she turned round to look for the reality of the form over her shoulder; but it was not visible, and it had also disappeared from the glass when she looked again in that direction. On the 26th of the same month, about two P. M., Mrs. A. was sitting in a chair by the window in the same room with her husband. He heard her exclaim, “What have I seen?” And on looking on her, he observed a strange expression in her eyes and countenance. A carriage and four had appeared to her to be driving up the entrance-road to the house. As it approached, she felt inclined to go up stairs to prepare to receive company; but, as if spell-bound, she was unable to move or speak. The carriage approached, and as it arrived within a few yards of the window, she saw the figures of the postilions and the persons inside take the ghastly appearance of skeletons and other hideous figures. The whole then vanished entirely, when she uttered the above-mentioned exclamation. The Schoolmaster, and Edinburgh Weekly Magazine, Volumes 1-2, John Johnstone, Publisher, 1832: p. 221. If the date on this story wasn’t much too early, we might suggest that Mrs. A. had been to Paris’s Cabaret du Neant and seen the coffined living decomposed to a skeleton and back in just minutes! To be Relentlessly Informative, the “punctured pattern” was an eyelet-like effect punched in the cloth with pinking irons. It was a cheap way to achieve a lacy look for grave-clothes and linens. In some variants of this next story, which was a popular urban legend, the ghost was recognized by a particular detail of the shroud. 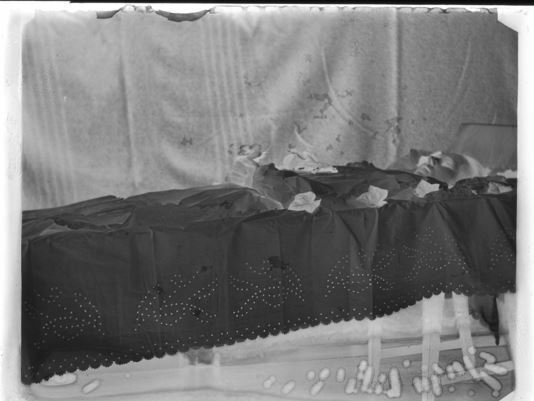 In this account from the séance-room, an apparition draws attention to her burial robe as proof of her identity. The shroud was also regarded as an infallible, if nuanced, death token in stories of second sight, presenting a sort of sliding scale of death. One of these seers had his vision calibrated to a nicety. Two seers at work, one a gentleman and the other ‘a common fellow’, who were both visiting the manse of an Inverness minister. All at once the common fellow began to weep and cry out that a certain sick woman about five miles away was either dead or dying. Shrouds seen via second sight might not only predict a death, but the form or color of that winding sheet. Today, although shrouds are making a comeback in the context of green burials, most people go to their final rest in their own clothing. Although I haven’t done a scientific survey, I’ve heard from people who have seen apparitions of friends and relatives wearing the same clothes they were buried in. That would not be particularly remarkable–if you saw the clothes at the viewing or funeral, you might picture the visitation wearing those clothes. Where that logical argument sometimes breaks down is when the witness did not go to the funeral or have any information about what the dead person wore in their coffin, but could describe the burial clothing anyway. Such anecdotes reopen the whole question of why ghosts are seen wearing clothes and why, if, as some psychic researchers used to suggest, the dead can project whatever image they want to those they visit, they choose to wear their last outfit? I’ve written before about shrouded specters and superstitions involving shrouds.